The north polar region of Saturn's ocean-harboring moon Enceladus, seen by NASA's Cassini spacecraft on Nov. 27, 2016. Saturn's moon Enceladus has had a rough life — and it's got the scars to prove it. A recently released photo by NASA's Saturn-orbiting Cassini spacecraft shows the many craters, as well as snaking fissures and other geological features, pocking the northern reaches of 313-mile-wide (504 kilometers) Enceladus. The presence of so many craters indicates that the region hasn't been resurfaced in a long time. 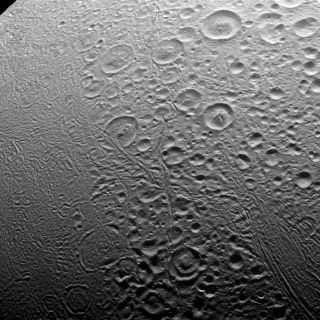 However, it's a totally different story near Enceladus' south pole, which "shows signs of intense geologic activity, most prominently focused around the long fractures known as 'tiger stripes' that spray gas and tiny particles from the moon," NASA officials wrote in an image description on May 3. This geological activity is driven primarily by Saturn's powerful gravitational pull, which churns and stretches Enceladus' interior, generating lots of friction and heat. This heat keeps the moon's subsurface ocean of liquid water from freezing, and also drives the geysers that blast from the tiger stripes, scientists have said. Cassini took the photo on Nov. 27, 2016, when it was about 20,000 miles (32,000 km) from Enceladus, NASA officials said in the image description. The spacecraft has been studying Saturn, the planet's iconic rings and its many moons since July 2004, and its work is nearly done. Last month, Cassini embarked on the "Grand Finale" phase of its mission, which consists of about two dozen dives between Saturn's cloud tops and the gas giant's innermost rings. On Sept. 15, Cassini will dive intentionally into Saturn's atmosphere. This suicide maneuver is designed to ensure that the probe doesn't contaminate Enceladus or fellow Saturn satellite Titan, both of which may be capable of supporting life, with microbes from Earth, NASA officials have said.